THE TEERITZ AGENDA: Adventures In Eyewear : Part Two- "Because When You're Cool, The Sun Shine On You 24 Hours A Day"
Adventures In Eyewear : Part Two- "Because When You're Cool, The Sun Shine On You 24 Hours A Day"
Yes, yes, I know I said I'd lay low for a while, but here's a post that I started at the beginning of Summer and, now that I'm a few weeks into Autumn, I figured I might as well put it up. It'll be Summer somewhere else soon. Adventures In Eyewear : Part One- "Nice Glasses, Four Eyes!" Now, Summer has ended here in Australia. Sure, there are a few warm and sunny days here and there, but I think the days of sun, surf and sand have given way to Autumn, so I figured it was time to cover the sunglasses that I have gotten over the years. The title of this post is a line out of My Science Project (Dir: Jonathan R. Butuel, 1985). This film came along hot on the heels of similar movies such as Back To The Future and Weird Science, but it didn't set the box-office on fire. But I'm not here to discuss '80s Brat Pack-laden teen sci-fi. There's a character in this film named Vince Latello, played by Fisher Stevens, who gets arrested and as he steps up to get his mug-shot taken, he's wearing a pair of black lensed plastic shades. The cop asks him; "Hey kid, why do you wear sunglasses at night?" Latello replies with the line above. It seemed a catchy enough phrase for the purposes of this post. And I've always remembered that line from the movie. It was oft-used back in my twenties when my friends and I rented a house at a seaside town for a couple of weeks one Summer. Add enough booze to a nightly card game and pretty soon, winning a hand of Poker becomes the last thing on your mind as the Jack Daniel and Canadian Club begins to run low and the ashtray fills up with the butts of Marlboro Reds and (my choice that year) unfiltered Lucky Strikes. Before long, somebody puts on their sunglasses while playing cards and utters that line from that movie. Anyway, the first decent pair of sunglasses that I bought was a pair of tortoise-shell RayBan Wayfarers back in 1986. RayBan had been enjoying a resurgence in popularity thanks to their patron saint, Tom Cruise, who wore a pair of black Wayfarer frames in Risky Business (Dir: Paul Brickman, 1983) a few years earlier. A few years prior to that, in 1980, we had Dan Aykroyd and the late John Belushi wearing black acetate sunglass frames. I don't know the make of Aykroyd's sunnies, but Belushi was sporting the unmistakable Wayfarer frames. RayBan was bought out some time ago by the Italian spectacles juggernaut Luxottica. This was good news in that it continued the production of these classic frames, among other well-known RayBan designs, but it meant that the brand was no longer Made In USA or utilised lenses made by Bausch & Lomb. Luckily, I have a few pairs of these frames. You might recall that I had one set converted into specs, which made me look like Brains from The Thunderbirds. I recently had these converted into prescription sunglasses for driving and they currently reside in the glove-box of my car. I'm not sure if the sweat bar actually does anything besides looking badass, but they were a nice looking frame. I say 'were' because, when my son was about two years old, I had these frames in my shirt pocket as I put him into his baby seat in the car. I must have leaned down a little too low because, about two minutes later, I drove out of the shopping centre car-park and reached for my sunnies in my pocket. They weren't there. I headed back up to where I had parked the car to find two dark circles on the ground where I had been. As I slowed the car down, I saw that the frames were bent at obscene angles and the 'two dark circles' were the shattered remains of the lenses. Nothing was salvageable. They were gone. I was miserable for a week. Still, could've been worse. I could have been wearing them when they got run over. 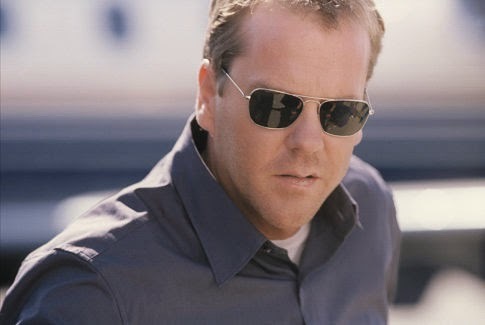 Anyway, years passed and I wore the Wayfarers until I saw Season 2 or 3 of 24 and spotted Keifer Sutherland's Jack Bauer wearing a cool pair of what I'd always called 'VietNam-era CIA operative's sunglasses'. 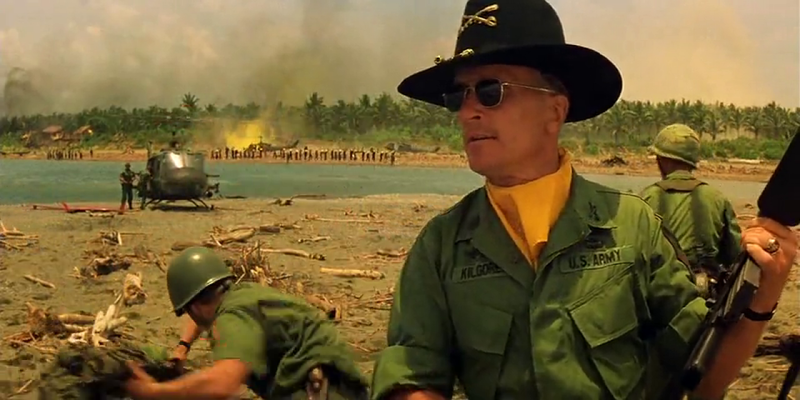 I found out a few years later that Bauer's glasses were RayBan Caravans. These frames were based on a classic 1930s design that were originally supplied to Air Force pilots. The Caravans have standard curved temples with tips that sit behind the ear, whereas the original design had straight temples so that they could be put on or taken off while wearing a helmet. There are numerous brands on the market that make these aviator specs. Two of the more reputable companies, in my opinion, are Randolph Engineering and American Optical. You can get these frames in brushed or polished steel, gold-plate, or black PVD-coated. When I decided to replace my crushed RayBan Outdoorsman frames, I opted for the Randolph Engineering frames in gold-plate. I felt that this was the most classic look for these frames. Notice the straight temples. One thing, though. You need to make sure these are a secure fit. Otherwise, they'll slip off your face when you look down. Of course, you can always put a slight bend in the temples of these frames for a tighter fit. While working in the CBD, I got to know one of the staff at a nearby optometrist. I noticed a nice pair of Persol frames one day, and the guy let me know that they would be going on sale soon. These were a nice black frame. Persol is one of the oldest optical manufacturers and their sunglasses are well-regarded. A friend of mine had a pair back in the late 1980s and I always thought they were a nicely put-together frame. These also have Polarised lenses to reduce glare. I first noticed this while driving one day in Summer. I glanced at my fingernails and noticed that they looked dull and matte. I removed the sunglasses and then saw my nails look shiny as the sun reflected off them. Polarised lenses are good if you do a lot of driving, or if you spend a lot of time on the slopes of Aspen during ski season. Me, I was doing a lot of driving. These frames have the classic Persol signature 'spearhead' motif at the hinges. There's a nice weight to them, too. I wore them quite a lot when I first got them. The Thomas Crown Affair (Dir: Norman Jewison, 1968) and subsequent photos of him in private life show him wearing other Persol frames, thus ensuring this brand a coolness factor that's through the roof. Do a Google search for "Steve McQueen Persol" and a bunch of pictures will show up. So now, I had a few different frames to choose from. When it gets sunny in Australia, it gets very sunny indeed. Given that I wear prescription glasses already, I'm careful to look after my ocular health, so I wear sunglasses whenever I'm out in the sun. A few years went by and all was well. By now, my wife had been bitten by the sunglasses bug and she scooped up a couple of pairs of sunnies off eBay. 'I blame you! ', she's often said to me. I reply with a comment about needing to protect one's eyes when out in the sun. 'You'll thank me one day, baby', I add. During out trip to Thailand last year, I visited a store in Bangkok and saw a pair of frames by a brand called Moscot. This is a family-owned company that set up in New York in 1915. I had already seen these frames on the internet some time ago, and there was a store in Melbourne that sold them also. However, Australian Dollar prices were obscene, so I steered clear of them. In Bangkok, however, the prices were far more reasonable, so I tried on a pair of 'Lemtosh' frames in tortoise-shell. They looked great. 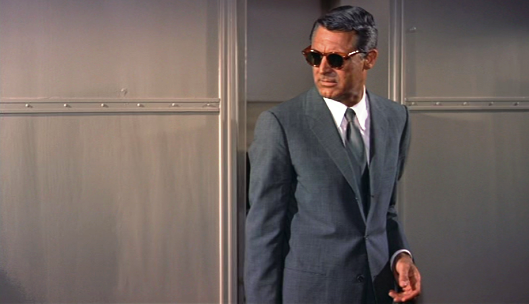 I had been thinking of getting a pair of frames like the ones Cary Grant wore in North By Northwest, as seen in the first picture of this post. After searching the web for info, I learned that his frames were made by a brand called Tart Optical. His particular frames, the 'Arnel', weren't available in Australia. I found Tart Optical's website and sent an inquiry. The price of these frames were somewhere around $550. Too rich for my blood. I had decided a long time ago that there were some prices that I just wasn't willing to pay for certain items. My absolute cut-off price for spectacles, be they prescription or sunglasses, was $300. Anyway, back to the Moscot sunnies. I tried them on in Bangkok. They fit nicely. Then I spent a couple of days thinking about it. They looked good, the lenses were fantastic, the price was right. That's my three main boxes ticked. Sold! These frames exude a beautiful mid-century aesthetic. Comfortable to wear and very well-made, with a more reasonable price than the Tart frames. I sure the Tart sunglasses are of a high standard, but I just can't justify that kind of price. The Moscot Lemtosh frames are a rich tortoise-shell, with brown polarised lenses. And I liked the idea of the company still being a family-run business. If I ever get to New York, I'll be sure to pop in to their store. Of course, whilst in Bangkok, I just had to walk into another optometry store, didn't I? And that's where I saw a pair of black RayBan Clubmasters. It would seem that most of your classic spectacle frames were designed throughout the 1930s, through to the 1950s because there's been a resurgence in popularity in frames from these eras. The Clubmaster frames were introduced sometime in the Fifties and I've seen many of them used in period films over the last twenty-five years or so. These frames can be seen on Denzel Washington in Malcolm X, Kevin Costner in JFK, and Willem Dafoe in Mississippi Burning. They are a classic frame, albeit they feel a little flimsy, since they're made up of a few parts that are screwed together. Still, they're a good back-up frame. As long as one is a little careful with them. Like the Moscot slogan says- Keep 'em in the case when they're not on your face. These'll look great when I produce Tony Curtis' next picture in 1960. However, man does not live by RayBans alone. My wife surprised me one day with a pair of sunglasses that she snagged off eBay for the princely sum of $20.00. These were a tortoise-shell pair of Tom Ford 'Snowdon' frames. Normally, I tend to shy away from fashion brands or companies that aren't known for producing certain products. Tom Ford (an absolute legend in my view) was a designer for the Gucci fashion house before he branched out on his own. I normally wouldn't look twice at fashion-brand wristwatches or sunglasses, but these frames are beautifully made and very solid. The lenses are polarised, which is an added bonus, and the fit and finish are above par. Sure, their design does owe a debt to RayBan and other brands of the 1950s, but I think this is precisely the point, and, while they do look a little like a pair of Wayfarers, closer inspection begins to reveal numerous differences in aesthetics. Before long, you realise that they are quite different to a pair of Wayfarers. DC's sunglasses are a new frame, to be released later this year, when the film opens. No doubt, as happens with the release of a new Bond movie in The Digital Age, various style websites will be awash with information on these frames, and everything else that Bond wears in the film. 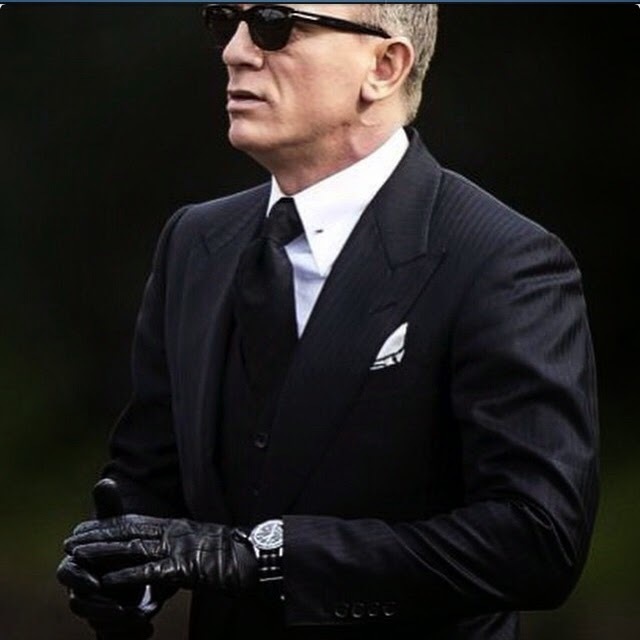 There's already a slew of info about Bond's accoutrements in SPECTRE on the fantastic James Bond Lifestyle. Com. That's a great website for Bond fans. But back to the sunglasses. These frames are extremely similar in design to the Snowdon frames I have. Not that I'll be rushing out to get a pair. In one of those rare instances, I'm ahead of Mr. Bond. It happened in '08 as well, when I already had a 42mm Omega Planet Ocean and then saw Craig sporting the same model in Quantum of Solace. Anyway, that's my collection of sunglasses. I could maybe go for a pair of Persol 649s or 714s, but there's no hurry. Summer's over here in Melbourne, although it's a nice sunny day here today as I write this. You may think that sunglasses can be expensive, and I would agree. However, I would always advocate that one should have a pair or two of decent, quality-lensed sunnies. You can get a cheap pair of sunglasses for five bucks, but they will be flimsy frames fitted with crappy coloured glass that offers your eyes no proper UV protection. May as well wrap green cellophane around your head or wear those 3D glasses you get from a cinema. There are numerous well-made sunnies on the market. The Randolph Engineering and American Optical aviators sell for around a hundred bucks. Same with a pair of RayBan New Wayfarers (Model No. RB2132), if you prefer plastics. These three offer some very nice frames for reasonable prices. If I wasn't already sufficiently loaded up, I'd be scouring these sites. Anyway, I've put most of my sunglasses into hibernation for the Autumn/Winter months. I have the Moscots, Tom Fords, and American Opticals within reach if I need them, but I think I won't be needing them much over the next six months or so. If you yourself have a decent pair of sunglasses, then great. If you don't, perhaps you may want to invest a few bucks in a well-made pair. You know me, gang. I'm always gonna say that you need a decent pen, wristwatch and pair of sunglasses. Hi Teeritz, nice post. Last year i bought a pair of B&L shooters at a flea market for 1/3 of the price of the new ones. They are in good shape and looks like they are of better quality than the recent Luxottica models. 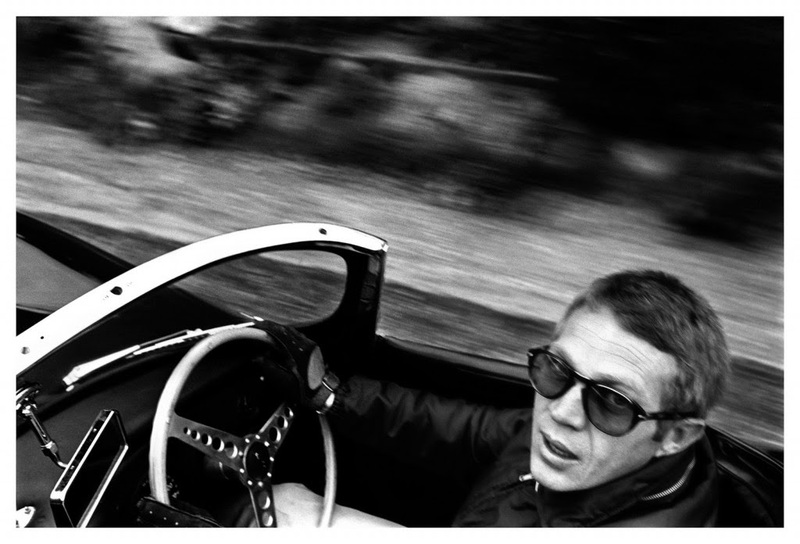 Nice post, I like Steve McQueen's Persol frame the best. Need to get a prescription pair, Coles lost my clip-on sunnies. That's to say I left them on one of them scan-it-yourself checkout machines. Went back the next day and spoke to the young lad who'd been supervising the checkouts and asked him if he'd found 'em. Yes, he replied and hurried off to get them for me - only he couldn't find 'em, said the cleaners must've thrown 'em away. Cheers Coles!